If you called a rose a shitbucket would it smell as sweet? Would it smell as sweet named ratbollocks? No. And the reason is because of the conections the other words and names have. Why a post devoted to this? Something I don’t normally believe in bothering with..
My husband and I had one of our rare arguments this more (I’m just usually right!). Due to family differences I have nothing to do with my biological mother, it’s far to complicated to even begin to explain but suffice to say I did not want her name in my own. So I changed it. I went to deed poll and had it altered. I never intended to change my name when I married, this was not something Mark was unaware of. However I was informed (whether correctly or not) that to keep my name I would have a form to fill in. I went from Emma Calvert Ruthven to Emma Calvert Stevenson upon marriage but was never truly happy and the only reason I didn’t alter it then was due to laziness above all else. A few months ago I knew it was time to finally change it. For me, not for anyone else. Now I should mention that I never liked the name Emma either. 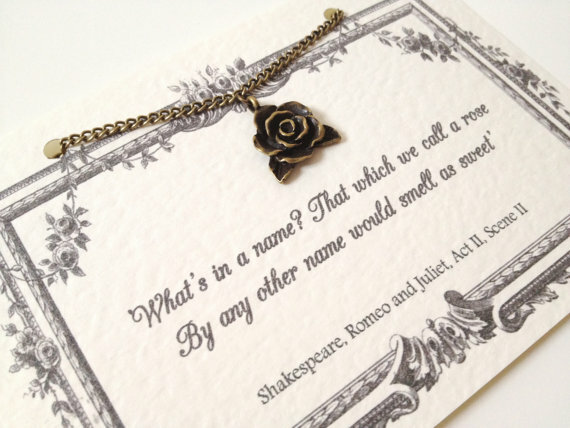 And I chose to think carefully about my name, I knew I wanted a middle name, I always had wanted one, now was my chance. But you don’t pick your own name, it is something given to you by your parents. So a hard thing altogether. Now my father is very patriotic, my name was chosen for the fact that it would give me the initials ER, as a child he nicknamed me Queenie. So I chose a middle name befitting his likes. Not my own. I became Emma Lillibet Ruthven-Stevenson. Lillibet being the nickname given to Queen Elizabeth. And I didn’t completely disregard my husbands name. Now I met with problems when I initially did this. Mark wanted me to be a Stevenson but after a LOT of explaining on my behalf about my name’s importance and significance to me he finally gave in. The problems started with a gift of land. A gift that entitled me to the title Lady. I’m pleased, it feels nice to me and for conservation purposes I enlarged my little plot of land to a rather large one and had them place certain implements upon it such as nesting boxes and bee housing, all made of natural stuff. I get my title and to help nature and the environment at the same time, bonus. So I have to take my forms to the bank etc, the forms specifically tell me that I must. Today I heard nothing but how Mark insisted I be only Mrs Stevenson. Is it unfair of me to want something just for me, regardless of what others think? I had always intended to keep the Mrs part, the title was neevr overly important, it’s nice for ME to know I have it! Now however, because I am majorly pissed of I feel I may demand that he address me correctly just out of spite. 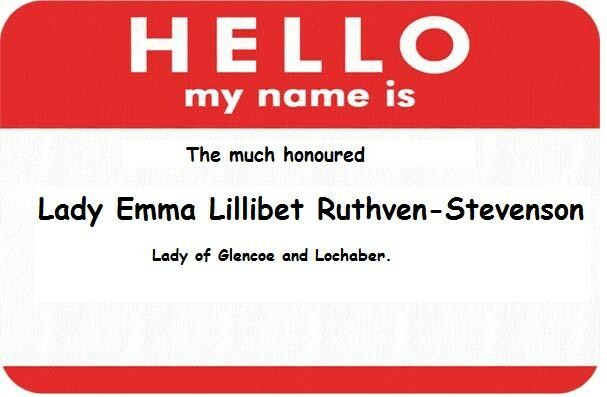 The much honoured Lady Emma Lillibet Ruthven-Stevenson, lady of Glencoe and Lochaber.